While it is easy to pile on the Phillies closer for his heinous blown save yesterday, let’s leave Jonathan Papelbon alone for a second. Papelbon is an easy target right now. Pappy had no command of his pitches yesterday, never found the strike zone, and lacked any mound presence. It's hard not to yell, "I didn't sign up for this" as you toss a bag of Cheetos at the screen and recall his attacks on the clubhouse, the team, and the front office last season. But is that really the proper reaction? We can blame him personally for not living up to his $50 million contract, but let’s face it, velocity has EVERYTHING to do with his struggles since last season. And is that his fault? If we discover he has not been preparing hard or taking care of his body properly (and I haven't heard any reports of that being the case), his body is doing what most bodies do as they age. Instead of killing Pappy, I would like to take our blame and redirect it towards the real problem which is the hopefully soon-to-be free agent general manager. Opening Week is officially over and the Phillies are on the winning side of .500. It was an entertaining week of baseball filled with its fair share of under-the-radar news. Here are a few Phillies tidbits you might find interesting. According to Jim Salisbury, Howard "has virtually abandoned the stretch at first. He catches most balls close to his body, costing his infielders valuable inches on close plays. This is something that needs to be addressed." A first baseman that does not stretch for balls at first? Can't say I heard that one before. To describe it as bizarre would be like saying this winter was a tad chilly with a few snowflakes. I had to double check before writing this to make sure it wasn't an April fools joke. With Ryne Sandberg, "Everybody hits! Wha Whoo! Watching Ryne Sandberg in the first week of the Phillies season is kinda like getting a brand new wife. You can date a woman for a couple years and get to know her fairly well, but once you get married and she has you locked in, it is a totally different ball game (pun intended). Similarly with Ryne Sandberg, he managed 42 games last season as interim manager, but that was not the real Ryne Sandberg. We have ascertained some information about the new Phillies skipper in the first week. We learned that he is not afraid to shake up the lineup, moving Howard out of the cleanup spot for the first time in forever (665 games to be exact). We also discovered that Ryno is willing to throw a young player into the fire, giving Mario Hollands his first big league opportunity in the ninth inning of a tie game. And Sandberg also showed that he has tremendous faith in Jake Diekman and zero faith in Brad Lincoln. Sandberg also explained that he wants to use his entire roster, giving as much rest as possible for his regulars. "I like to play the whole roster and get everyone in," Sandberg said. "Generally speaking, I believe it takes all 25 guys to get through a baseball season, and to keep everybody fresh and everybody healthy is always a plus to get through the season, especially with our group of core players. For us, we need that." Sounds smart in theory, but how does it play out in reality? The Phillies have played 7 games, which is less than 5% of the 162 games that make up a baseball season. Cole Hamels has yet to pitch, Mike Adams is still rehabbing, the Phillies have played just three teams, enjoyed only a single home game, and “hitting season” is still about a month away. In other words, it is early. Seven games is hardly enough for any proclamations, but it gives an indication, if not a prediction, of what path this story will follow. In my opinion, there are more reasons for optimism than not. Why are the Phillies in last place after being swept in their first home series against the Brewers? The answer, without a doubt, is the bullpen and defense. Stop it right there. Don’t bother looking any further. --The Phillies lead baseball with 10 unearned runs. No other team in baseball has more than seven (Padres and Marlins). --They are fourth in baseball with nine errors. Only the Dodgers, Marlins and Rangers have more with 11. It goes much, much, further than pure statistics, however. The bullpen and/or defense has directly caused three of the Phillies’ six losses and had a major impact on every loss this season. The best way to explain the extent of their impact is to go somewhat play-by-play through all six losses. I will take you through the specific plays involving the bullpen and defense in each painful loss followed by a brief overview. Feel free to read the details if you like, but you might be better off just skipping to the overview. The Phillies took a 4-2 lead into the seventh inning of last night's game and left with the game tied at four. It was the sixth time in 11 games the Phillies allowed at least one run to score in the seventh inning and the Phils have surrendered a total of 10 runs in the seventh this season. With only 1 run scored on the offensive side, that puts the Phillies at a net loss of 9 runs in the seventh inning. Four relievers have allowed runs in the 7th inning: Diekman (twice), Rosenberg (twice), Manship, and De Fratus. These problems, of course, are not limited to the seventh inning. The Phillies have allowed 23 runs in innings 7-9 while scoring just seven. It is difficult to hype a series just 12 games into the season, especially with a Phillies team with low expectations. But if such a thing is allowed, this upcoming 4-game series against the Atlanta Braves at Citizens Bank Park is one to hype. In many ways, this series could be a measuring stick for the entire season. After an embarrassing sweep at the hands of the Brewers, the Phils dug themselves out of a hole by sweeping the Marlins and worked themselves back to a .500 record at home and for the season as a whole. Now they face a Braves team who swept a Washington Nationals team who many feel should win the NL East. Now that Monday's loss to the Braves has mostly scabbed over, I wanted to look back at the game through a different lens. Monday could have been a harbinger of things to come and a loss that will send the Phillies down an inevitable losing path or it could be used as a character builder. Supposedly high character teams would view such a devastating loss as an opportunity, exploiting it to create unity and developing the personality of the club. Low character teams would collapse and begin an early tailspin. Let's continue the theme of character and examine the character of the Phillies. The Phillies watched the Braves transform a 2-1 lead to a 5-1 lead in insulting fashion with back-to-back-to-back jacks and another close game was given away by a dreadful bullpen. But the Phillies showed tremendous character in the following “shut down” inning. Gwynn worked a walk, Rollins lined a single to left, and Utley laced a single to right to load the bases with nobody out. When Ryan Howard struck out (more on him later), it took a little more air out of the balloon. But Marlon Byrd displayed his character by picking up his teammate with a sharp single of his own to make the game 5-3. Then Domonic Brown belted his first home run in the biggest of moments, giving the Phillies the lead and sending the fans to their feet. Brown showed character with the timing of his blast as well as the way he handled the big moment. There was no bat toss, no slow-motion trot around the bases, no showing up the pitcher, and no mocking his opponent. Dobo allowed the results speak for themselves, truly acting like he had been there before. And the rest, well, this video should sum it up for you. The Phillies love west coast trips, seriously! The Phillies have embarked on a journey to a place where many baseball seasons have gone to die: the dreaded West Coast trip. These are the types of trips that can make or break a season. Plenty of bad Phillies teams have hovered around .500 just like the 2014 Phils, only to return from the west coast in the NL East basement, never to be seen or heard from again. This is a crucial week plus for the Phillies. After a losing homestand with many empty blue seats, they cannot afford a bad trip out west if they expect any fans here when they return. 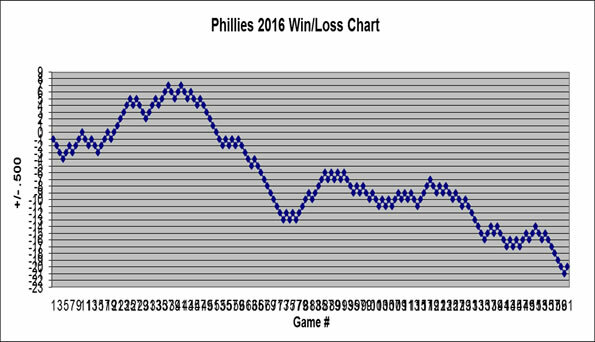 The good news is that the Phillies have fared well on their recent western swings. I went through all Phillies trips back to 2005 (Charlie's first season as Phils manager) to see their records in each season. I included all trips in which the Phillies played at least one series in a city on the west coast and counted all teams the Phillies played on that trip. So, if they played the Braves during the trip, they were included. In 157 games from 2005-2013, the Phillies have an unbelievable 90-67 record. That obviously includes five NL East champion teams and all but one team had a winning record, but 23 games over .500 is remarkable. How clutch is Jimmy Rollins? Jimmy Rollins' walk of home run last week was the second walk-off homer of his career. Rollins has always been a prime time player who loves hitting in the big moments. And his former manager and current coach Larry Bowa sure thinks so. "Jimmy's a red-light player," Bowa said. "He loves when the game's on the line. He wants to be up there." Rollins is generally viewed as a clutch hitter, but I thought I would test out the theory. Let's start by comparing Jimmy's career statistics against certain clutch stats based on figures by Baseball-Reference. One measure Baseball-Reference uses for a player's "clutchness" is splitting performance into high, medium, and low leverage situations (high meaning most pressure and low meaning minimal pressure). BR also has an algorithm for "Late and Close" situations which I also included. Note that the run, home run, and RBI totals are all prorated for Jimmy's career average of 739 plate appearances per 162 game season. Let's begin by comparing Jimmy's regular season stats with "Late and Close" situations, prorated over a full season. Surprisingly, in "Late and Close" situations, Jimmy performs below his career averages in nearly all categories. The figures are all very close to his career totals, but they certainly do not indicate a player who rises to the occasion in the key moments. But viewing Jimmy in high, medium, and low leverage situations tells a different story. Phils finally own the worst bullpen in NL! It took a little while, but the Phillies finally own the worst bullpen in the National League. After allowing 4 runs in five innings yesterday during mop up duty for Pettibone's mess, the Phils finally pushed themselves to the top of the list with a 5.59 ERA. The Phillies have five relievers with an ERA over 7 and, excluding Adams and Garcia who only pitched one inning, the Phillies have only pitcher with an ERA below 3 (Mario Hollands). After scoring 5 runs in one inning on Monday, the Phillies have scored just 2 runs in 28 innings and amounted a total of 13 hits in three games. As you can imagine, slightly over 4 hits per game for three games has taken its toll on the Phillies' batting averages. The below chart shows individual performances in the last three games and how their current batting averages compare to what they were just three games ago. Here's a look at the carnage. The team scoring has plummeted, as well. The Phillies were around the middle of the league in most categories a few days ago, but now they are creeping towards the bottom. Here are the current team stats and NL rankings. With nine game still remaining on the road trip, the Phillies better get their act together...and fast. I mentioned before how the Phillies bullpen is the worst in the league, the starters are fifth worst, and the team pitching overall is second worst. Combine that with a now below average offense and the Phillies may not survive this trip. One of the best parts of April baseball is the huge swings (no pun intended) in batting averages. That was never more evident than in Colorado on Sunday. Those be some hideous numbers. In our regular feature on Phils Baseball, here are rumors from the past week from the guys at MLB Trade Rumors. They have a page devoted just to Phillies rumors (this is not a paid plug, honest) and all we do is put everything from the past week in one post. There wasn't much on MLB Trade Rumors this week, so I also included some excerpts from other media sites. Domonic Brown, after hitting 27 home runs last season, has just one through 24 games this season, pacing him for under 7 homers this season. Brown was asked last week when he expects his power to return. One hitter we would not expect to hear such sentiment from is Ryan Howard. Unlike Domonic Brown, Howard was never interested in learning how to hit. As long as he was mashing balls onto Ashburn Alley, he wasn't much concerned with the other peripheral stuff. His approach worked for several years, earned him a huge paycheck, and played a big role in handing Philadelphia a championship. When things were going well, his swing a big, heavy, bat really hard in case you hit it approach created unparalleled production in a four year span from 2006-2009 in which Howard hit 198 home runs and knocked in 572, for an average of nearly 50 home runs and 143 RBI per season. But through his first 70 plate appearances this season, Howard was hitting .217 with 3 home runs and 7 RBI. His .329 OBP was 7 points above the league average, his .400 SLG was 11 points above average, and his .729 OPS was 24 points above average. Slightly above the league average is acceptable for a number seven or eight hitter, but not for a cleanup batter earning $25 million a year. That is especially the case for a player who cannot run and is the worst defensive player at the easiest defensive position. It was at that time I decided to expose Ryan Howard for continually refusing to dedicate himself to improving upon his major inadequacies and becoming a hitter rather than just a power hitter. Then Howard messed everything up by hitting home runs in back-to-back games and going 6 for 10 with 5 RBI, while nearly hitting for the cycle. But I won't let that distract me from my original intention of some good old fashioned Ryan Howard bashing. Philler Up! Comebacks, milestones, broken cycles, Utley at first? The Phillies earned themselves a nice comeback win yesterday, scoring 6 unanswered runs in the eighth inning in a 6-5 victory. It was the first time they won a game in which they trailed by five or more runs after the sixth inning since July 24, 2012. It was also the first win this season when trailing after seven innings. With their win last night, the Phillies are 5-4 on the trip and guaranteed at least a .500 road trip. Here are more interesting news and notes from the Phillies on get away day. Third base has not been kind to the Phillies this season to say the least. Cody Asche made small strides to change that. With his game-tying double last night and a 1-for-3 effort on Friday, Asche finally raised his average above the Mendoza line at .214. Freddy Galvis, well, they haven't named the line he is under. Galvis is hitless in his last 21 at-bats and has 1 hit in 30 at-bats this season. It dropped him even further below the Galvis line with an .033 average to go along with an .091 OBP, .033 SLG, and .124 OPS. Through his first 14 games this season, Carlos Ruiz was batting just .204 with four extra-base hits and no RBI. But Ruiz is batting .500 with a .593 OBP, 1.502 OPS, six extra-base hits (4 2B, 3B, HR), seven RBI, and eight runs scored. It raised his average 92 points to .296 and his slugging percentage (.476) and OPS (891) are now both second on the team. Jimmy Rollins' single yesterday puts him just 35 hits away from breaking the Phillies all-time record for most hits as a Phillies player. Mike Schmidt is the current owner of the record with 2,234 hits. Cliff Lee’s two walks last night equaled his total walks all season entering the game. Dating back to Sept. 6 of last year, Lee had walked three in his previous 10 starts. Since Ryne Sandberg appears willing to remove Howard late in games for a pinch runner or for defense, he was asked about the prospect of moving Chase Utley to first base. Major League Baseball upheld the scoring on Ryan Howard's single and error from April 20, which means he remained a double shy for the cycle in that game. Despite a brutal bullpen and falling 3 games under .500 to begin a 10-game road trip, the Phillies finished with an even record in the first month of the season. The Phillies followed a 4-5 home stand with a 6-4 west coast trip.